When you run a small business like Peggy Li Creations handmade jewelry, you learn to make the most of your jewelry resources and supplies and pick up any great tips to make your jewelry making life easier and simpler. OK, so here's a great tip I picked up from some wonderful jewelry making instructors. It's easy to make a homemade jewelry tumbler! What are tumblers good for? You can use a tumbler to help remove firescale from your soldered metal pieces, harden homemade headpins/earwires (that you make from dead soft wire), and polish/harden your sterling silver pieces! Clean plastic mayo/peanut butter/sturdy plastic jar with screw-top lid. Not too big, because you'll be shaking it with your hands. Blue Dawn dishwashing liquid soap. Put shot in the jar about 2/3 of the way in. Put a little dishwashing liquid in with the shot and water to cover in the jar. Wire your silver pieces together (so they are easier to fish out) and drop them in the jar. Shake, shake, shake! Give it a good shake for a few minutes. Remove your pieces, rinse well. Don't forget to dry your shot thoroughly when done. I like to spread it out across a towel. 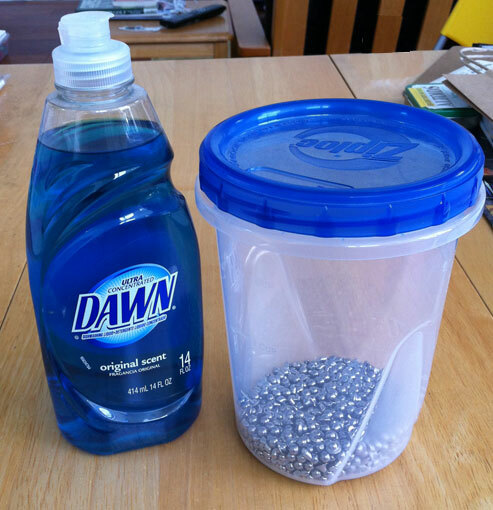 Another great alternative is to take some tupperware and use that if you don't have a clean plastic jar. It leaks a little when you shake, so be careful! Blue Dawn soap and a tupperware-style container as your tumbler. I have 1 lb of shot in there! That's it! Now, there is some debate as to whether tumbling actually "work hardens" metal, with many folks saying it does not do this. At the very least, a good tumble will clean and polish your pieces, so there is certainly still benefit to finishing your jewelry pieces in a tumbler. Be sure to check out my handmade jewelry creations at Peggyli.com. *UPDATE* - since this post I have since purchased a tumbler for my studio (my arms were getting tired!). I purchased a Lortone Tumbler, 3lb capacity from one of my fave supply stores, Beaducation. There is a handy video on the website as well, so check it out! Thanks very much for sharing this idea! I just found your blog and love it. Thanks for the tip! I'm off to get me some non-ferrous shot. Thanks, I was just thinking of how much a tumbler costs and then I remembered reading about your tip sometime ago. Will any other dishwashing liquid suffice (I live in the UK)? I don't know why she suggested Blue Dawn liquid soap specifically... I'm guessing any non-abrasive soap would work fine. I'm going to use some green Palmolive soap I have, personally ;-). Good luck! I see dawn recommended in a lot of books, something about the PH factor I think. Thanks for the tip. I never thought of actually making a tumbler myself before. I have a silly question, what is a stainless shot? And how much of it do I put into the container before shaking? Use about a cup of shot, depending on the size of the container. Give yourself room for the items to move around! heh, thats pretty cool - cheap too! How long have you been making all this stuff then? Brill I will be making one of these when I get a empty jar. Try the outdoor section of your locat discount store for the steel shot. 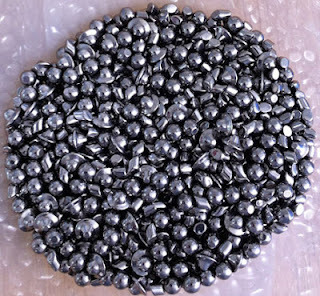 It is used in shotgun shells for waterfowl, and as BB's, if they have reloading stuff they will have the shot! I don't think you would want to use your dryer. It would be hard on it I would think. I guess I would be one way to get my arms in shape! I was wondering about bbs. would those work? I know they're not different sizes or shapes but was curious what you thought. We go through a lot of peanut butter at my house and I find them extremely9 useful for holding many things, especially fluids. No, I wouldn't use BBs since they will get rusty with exposure to the water. The medium used in tumblers is a stainless steel to resist corrosion. Can you use this method for doing rocks and other things just adding compound with water to polish stones, etc? Sonny, I don't think this method will work for polishing stones! You need much more agitation than this will provide. A mechanical tumbler will probably work better. The kind of "shaking" I need for my gemstones to polish would take days, even weeks, constantly, day and night. My arms could not take shaking it that long! I think I'll buy me a jewelry tumbler. (I have tendonitis in my shoulder.) Too painful and not practical. Thank you for the idea, though. Very clever! I, too, am new to this; I've been gathering some materials before I jump in with the clay, but I was wondering if just rolling the container, either with your hands or your foot would work. How long does it take? 5 minutes? 1/2 hour? and how will you know when it's "done?" I guess I'll need to fish out the PB container from the recycling bin! Thanks for all of your efforts to educate! It's people like you who help people like me ever get started! Yes, any way you can agitate the container will work. I've since learned that tumbling is really only a surface finish - no such thing as using a tumbler to "work harden" completely. I'd say it takes a few minutes just to get a great shine/clean up the pieces. I have used Dawn with my SS shot and tumbler for a while now. BUT if not previously mentioned be careful not to use TOO much Dawn. It will eventually break down the tumbler material a tad, so you will have to clean it several times prior to using again. This happened to me when I noticed my pieces had a "sludge" on them after tumbling.